Our Wild Birds: Spring Time is Here! 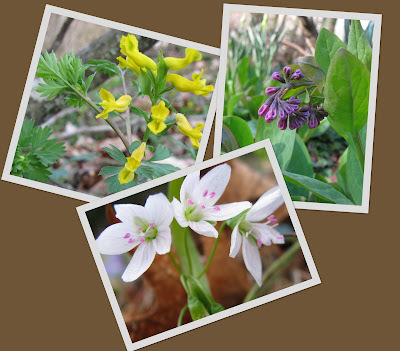 Taking a quick run around the property, we found that many flowers have come up to welcome Spring. A couple nice stands of Yellow Harlequin (Corydalis flavula) were a pleasant surprise; as was the finding that our patch of Virginia Bluebells (Mertensia virginica) has survived the hounds, and actually spread substantially - Yea! For some reason, our Spring Beauty (Claytonia virginica) is never as pink as it is "supposed" to be. This early we always have very numerous Toadshade (Trillium sessile) one of the lesser appreciated Trillium, but since we have so many, we really like 'em. Our Cut-leaved Toothwort (Dentaria laciniata), seems to be more blue or pink than the true white that you find in the guides. 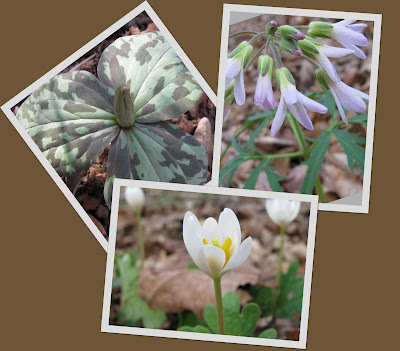 By and large, though, our favorite of our true wildflowers is the Bloodroot (Sanguinaria canadensis). The large expanse carpeted by these delicate little flowers, is a joy to behold.